If you own a TVR, or are passionate about the marque, or would just simply love to own one at some point in the future, membership of the TVRCC is not really an option, it becomes a necessity. 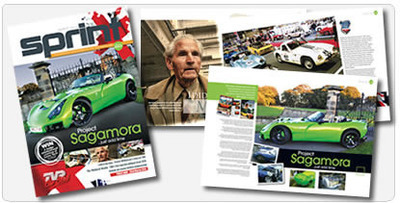 Monthly Magazine - Everyone receives Sprint, the 64-page monthly full colour A4 magazine packed full of TVR related articles, photographs, motorsport reports, specialist companies and one of the largest single monthly listing of TVRs for sale anywhere in the UK. It is not available to non-members. It has won a series of industry accolades including either winning or taking runner-up as Best Car Club Magazine from Classic and Sports Car Magazine every year since 2006. Insurance - The TVR Car Club has negotiated special rates with a cross section of insurance companies for Club members which, for many, will offer the very best cover available. Other events - The TVR Car Club organises a number of non-track related events throughout the year to bring enthusiasts together. Regional Events - The Club has 43 individual regional monthly meetings spread around UK ranging from the Highlands of Scotland to the Channel Islands. These allow members to talk to other owners about their experiences with their cars and frequently gain valuable local advice about specialist services. If advice is not available locally, the Club has access to host of other specialists who will be able to answer your query. Member's Pages - This area includes access to the Club Archives, nationwide future events calendar and an increasingly busy discussion forum with over 5000 registered participants and over 5M hits per month.